The Food Alphabet and More: Half Dozen Mrs. Fields Cookie Nibblers for only P38.00! Half Dozen Mrs. Fields Cookie Nibblers for only P38.00! Celebrate 38 years of Happy Moments with Mrs. Fields as we treat you to a whole day of happiness on August 15! 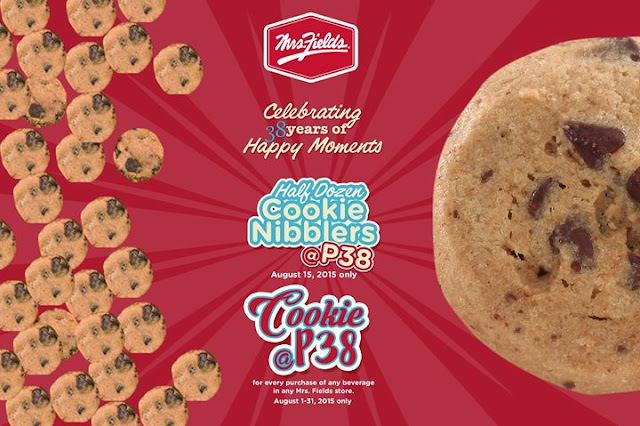 Get half a dozen COOKIE NIBBLERS for only P38 at all Mrs. Fields branches! 1. On August 15, get half a dozen cookie nibblers for only P38 in all Mrs. Fields branches. 2. Customers can buy unlimited half dozen cookie nibblers. 3. Offer is available from store opening to store closing. 4. The one-day Anniversary Treat cannot be used in conjunction with other store promos or discounts. Enjoy our sweet month-long celebration! Buy any beverage and get COOKIES for only P38 each! 2. Get any regular, freshly-baked cookie for only P38 each, no limit. Get as much as you want! 3. Available at all Mrs. Fields stores from August 1 – 31, 2015. 4. This offer cannot be used in conjunction with other store promos or discounts.